It may have started off as a rumour, but KTM has decided to bring the Duke 125 to India. There are significant changes, however, from the one sold in international markets. At Rs 1.18 lakh (ex-showroom, Delhi), this is the costliest 125cc bike in India. Internationally, the baby Duke is styled around the Duke 390 with a full colour TFT instrument cluster and LED headlights. In India, the bike looks a lot like the Duke 200, with only graphics to tell the bikes apart. Power comes from the 125cc liquid-cooled single cylinder that produces 14.5 PS of power and 12 Nm of torque mated to a six-speed gearbox. This makes it the most powerful 125cc bike in India. Braking is handled by a 300 mm disc up front and a 230 mm disc in the back, with single channel ABS fitted as standard. The bike gets a few segment-firsts in the form of an aluminium swing arm, trellis frame and 43 mm upside down front forks. Rear suspension is handled by a 10-step preload adjustable monoshock. 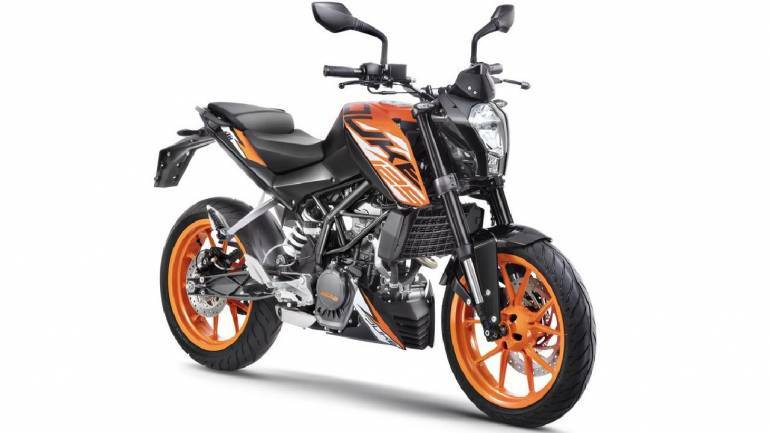 The KTM Duke 125 may be a 125cc, but its power and price puts it in direct competition with bikes like the Bajaj Pulsar NS200, Yamaha R15 V3.0 and TVS Apache RTR 200V.